Donaghmore. Composite Cross. East Face. Detail of Shaft. Panel E2. Adoration of the Magi. Donaghmore. Composite Cross. West Face. Detailed View of Shaft. Lower Panel. E1 Adam and Eve. Donaghmore. Composite Cross. West Face. Detailed View of Shaft. Lower Panel. E1 Adam and Eve knowing their nakedness. Donaghmore. Composite Cross. West Face. Detailed View of Shaft. Lower Panels. Donaghmore. Composite Cross. West Face. Detailed View of Shaft. Panel W3: The Sacrifice of Isaac. Donaghmore. Detailed View. East Face. Cross Shaft. Donaghmore. Detailed View. South Side. Cross Shaft. Donaghmore. Detailed View. West Face. Cross Shaft. Donaghmore. General View. North Side. Donaghmore. General View. West Face. Cross Shaft. Downpatrick. Cross Head and Shaft Mounted outside the cathedral. East Face. General View of Shaft. Downpatrick. North and South Crosses. General View of Shaft. Drumcliff. Detailed View of Cross. East Face. Drumcliff. Detailed View of Cross Head. East Face. Drumcliff. Detailed View of Cross Head. End of Cross Arm. South Side. Drumcliff. Detailed View of Cross Shaft South Side. Drumcliff. Detailed View of East Face of Cross Head and End of Cross Arm, South Side. Drumcliff. General View of Cross. Drumcliff. General View of Cross. East Face. Drumcliff. General View of Cross. South Side. Drumcliff. General View of Cross. West Face. Duleek. Close Up View of Cross Head. North Cross. West Face. Duleek. Close up View of Cross Head. South Cross. East Face. Duleek. Cross Shaft. North Cross. West Face. Duleek. General View of Cross. North Cross. North Face. Duleek. General View of Cross Head. South Cross. East Face. Duleek. General View of Cross Head. South Cross. West Face. Duleek. General View of Cross Shaft. North Cross. East Face. Duleek. General View of Cross Shaft. North Cross. West Face. Duleek. General View of Cross Shaft. North Cross. West Face and North Side. Duleek. North Cross. North Side. Close up of panel at end of cross arm. Durrow. East Face. Detail of Shaft. Durrow. General View. East Face. Durrow. General View. West Face. Durrow. North side. Close up of panel N1. Durrow. North Side. General View. Durrow. South Side. Detail of Shaft. Durrow. South Side. General View of Shaft. Dysert O'Dea. East Face. General View. 24'' high and 13'' wide. 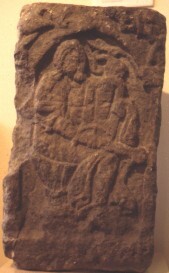 Cross shaft fragment, dated to eleventh century. The figure on this fragment is believed to be the Blessed Virgin Mary and Child. However it is very difficult to make out, and it has also been suggested that this represents an evangelist holding a book. The figure is seated under an arch supported on pillars, but this is nearly broken away on the right side.